We are a leading Manufacturer & Exporter of Loading Dock & Leveller such as Dock Leveller and Loading Dock from India. Dock Leveller is an adjustable ramp which finds its application in transporting vehicle and dispatch area of ware house or factory for an efficient material transport application. It fills the gap between the dispatch area and the transport vehicle and provides a substitute for variations in the truck bed height. ‘Gujarat’ is a well-reckoned name amongst the suppliers of loading dock lift table. This heavy-duty lift table is best answer for catering to the lifting requirements of our clients. 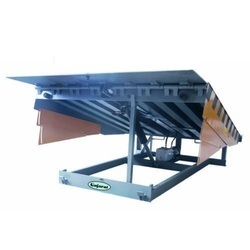 These loading dock lift table are presented in accordance with our client specifications and are used in material handling industry for various purposes. It has a capacity up to 6000 kg. 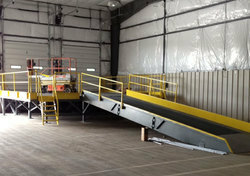 Looking for Loading Dock & Leveller ?